For the most part, I choose fairly flat stones to become Alchemy Stones. Painting on a flat-- or flat-ish, at least-- surface makes the most sense to me. As I am not formally trained in graphic design or architecture, I really don't have much experience with working with three-dimensional art and drawing. A few of the stones I bring home are quite thick and round-- for various reasons, they were "appealing" enough that I wanted to work with them. 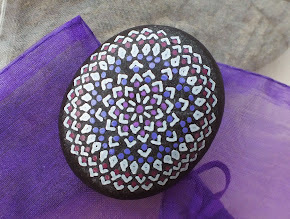 Most of the time, I can examine a stone-- hold it, touch it, turn it-- for a while, after which it will "tell me" how to paint it. On thick stones, there are usually "ridges" and "spines," as well as some relatively "flat" planes that can become natural parts of the design. As I have pointed out before, it is important to me that the stone and design fit "naturally" together. 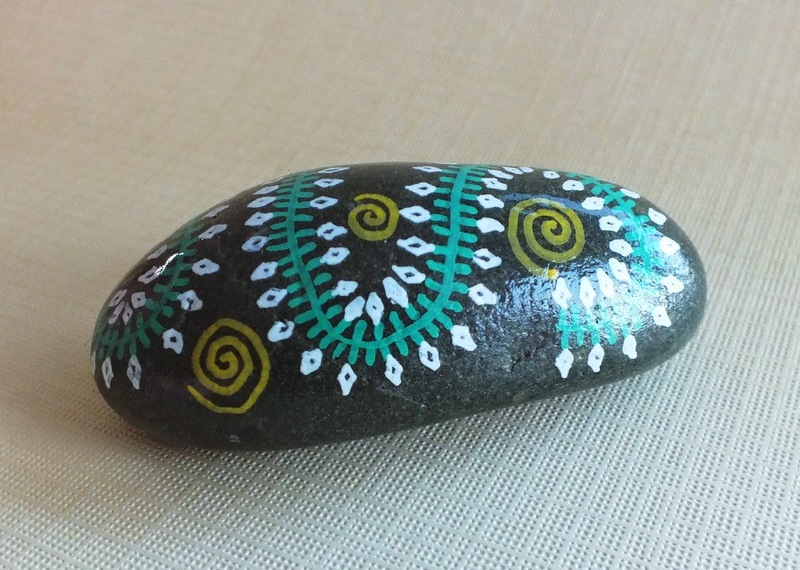 There's much more to an Alchemy Stone than just "slapping some paint on a rock."